To pick up arriving passengers, drivers should follow signs to the Arrivals Level curbside. Arriving passengers proceed from Baggage Claim up a ramp and outside to the Arrivals Level curbside to meet transportation. Free Cell Phone Waiting Area - Visitors are encouraged to use this area as an alternative to parking facilities while waiting in vehicles to pick up passengers. Alternatively, parking in all parking areas is free if you exit within 10 minutes after entering. Pay & Go is a new automated system designed for quick and easy exiting from the parking facilities at Dulles Airport. PAY & GO is available in all Daily, Hourly and Economy parking areas. Pay & Go machines are located in the lower level of the Terminal near the east and west exit doors and on the pedestrian bridge, which connects the Terminal to the Daily Parking Garage. Payment Methods: At Pay & Go machines or at the vehicle exit pay by: Cash, American Express, Diners, Discover Card, MasterCard, and Visa. 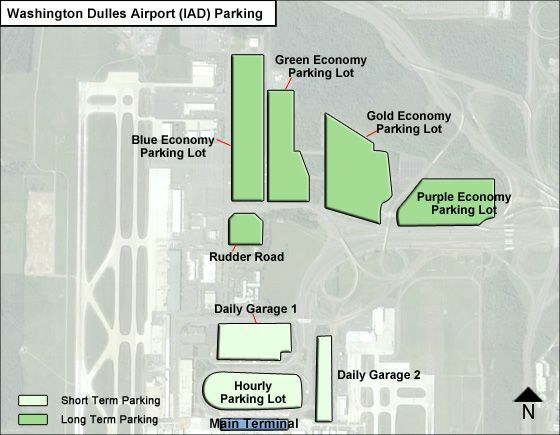 Notice to all Patrons using Dulles Parking Lots: - Vehicles parked in any parking lot for more than 45 days will be towed at the owner's risk and expense. Towing: $125.00; Storage: $15.00 per 24-hour period. Towing fee may be greater if performed by a third-party contractor. Hourly Lot is 10' 6"
Daily Garages are 8' 2"
Dulles Parking Customer Service (703) 572-4500. The following services are available at this number, from your shuttle driver, or from call boxes in the parking lots: (a) general questions about lots and rates; (b) Jump Start and air for low tires; Vehicle location service. Handicapped-accessible parking is provided in the Hourly lot, the Daily Parking Garages on the first level, and at the Economy parking lots in spaces adjacent to the shuttle bus stops. Disabled-Accessible courtesy shuttle service is available between the Economy parking lots and the Main Terminal by calling (703) 572-4500. This service may also be requested in the Economy parking lots by using Customer Assistance Call Boxes.